It’s been said that the Nintendo Switch, despite being one of the most innovative new consoles of all time, has one glaring issue. And that issue is that it simply has too many spectacular games (a problem the Sega Saturn so desperately wishes it had). 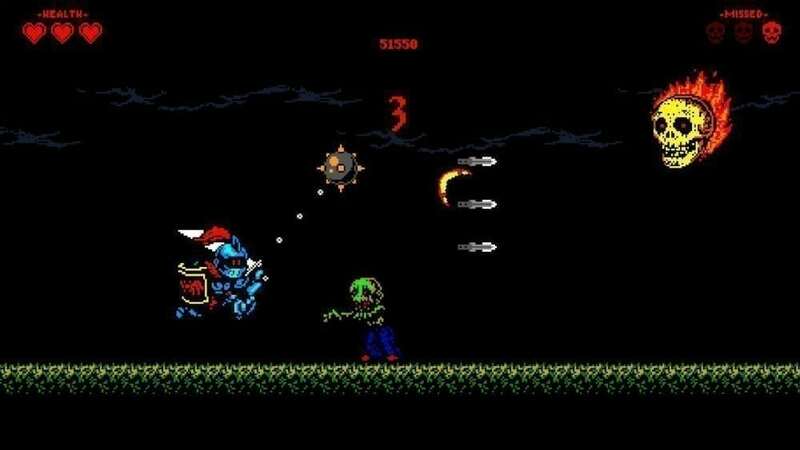 Well, you can add one more game to that list with Knight Terrors, a horror-themed side-scrolling action game where you must jump like a madman, fly around, and cut down hordes of zombies. Oh, and you’re a knight by the way. I feel like no further explanation is needed. Knight Terrors is a pretty simple game to explain. You simply jump over patches of spikes, attack any enemy in your way, and attempt to glide between larger spikes Flappy Bird-style. The game is a continuous side-scroller, meaning there’s barely any time to breathe within all the action. You can only get hit three times and only allow three enemies to get past you, so you’ll want to stay safe whilst defeating every zombie, giant bat, flaming skull, and alien along the way. I’d say that’s pretty good advice in real life as well. It’s often been said that indie games tend to overdo it on the retro-style graphics. And, yeah, it’s true that it’s become almost a standard amongst indie games. However, there’s something so appealing about the way NES-style graphics are used in Knight Terrors. It gives me a very Ghosts ‘n Goblins vibe, which fits the gameplay perfectly. Plus, pixelated blood just looks so much cooler than realistic blood. But let’s get down to the most important part of this review and the part that many of you may skip to altogether making the rest of this article utterly pointless: is Knight Terrors fun? It absolutely is! While some may argue that an arcade-style title such as this belongs more on the App Store, I find the precise controls of the Switch to fit it perfectly. And, since you can bring the Switch with you on the go, it’s the perfect way to kill time while you’re waiting for the train. And much-deserved extra points for the punny title.